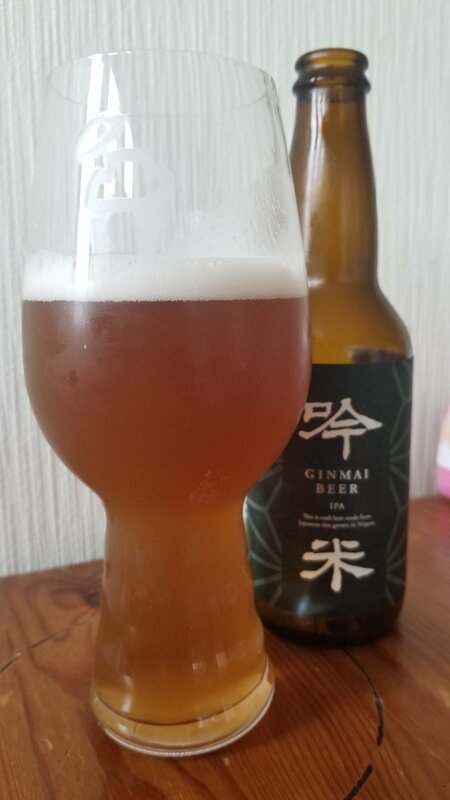 Ginmai IPA is a 6% English IPA from Tainai Kogen Beer, based in Niigata, Japan. It’s part of their Ginmai Beer range and can be found in both bottles and on tap, though the latter is likely to only be in Niigata. Ginmai IPA, like the white, is brewed using locally grown Koshihikari rice, one of Japan’s most famous strains of rice, and it is also brewed with three different kinds of hops though which ones are unknown at the time of writing. An English IPA?! Been a while since I’ve had one of these in Japan, what with the push for everything to be American. It’s not a complaint, but it’s good to have a malty beer once in a while. Ginmai IPA poured out a dark copper brown colour with a thin white head on top that faded fast. There was a distinct rice twang to the nose, kind of like a watered down sweet sake nose to it, along with a hint of butteriness in the background. The hops brought an earthiness to the aroma, perhaps some East Kent Golding and some Fuggles in there for good measure but there is no chance of mistaking this for an Americna IPA so Citra and Cascade hopheads should move away. The body did have an initial bitterness to it that was strong, but that faded to a smooth underlying twang throughout drinking. The rice flavour was as present in the body as it was in the nose, with the butteriness too. The malts brought a caramel and bread flavour to Ginmai IPA, but the bitterness was slightly more powerful than those flavours. Ginmai IPA finished off with a grainy rice bite to it that faded to an edge of bitterness. As an English IPA, Ginmai IPA is ok – it’s easy drinking and is a solid example of an English IPA.